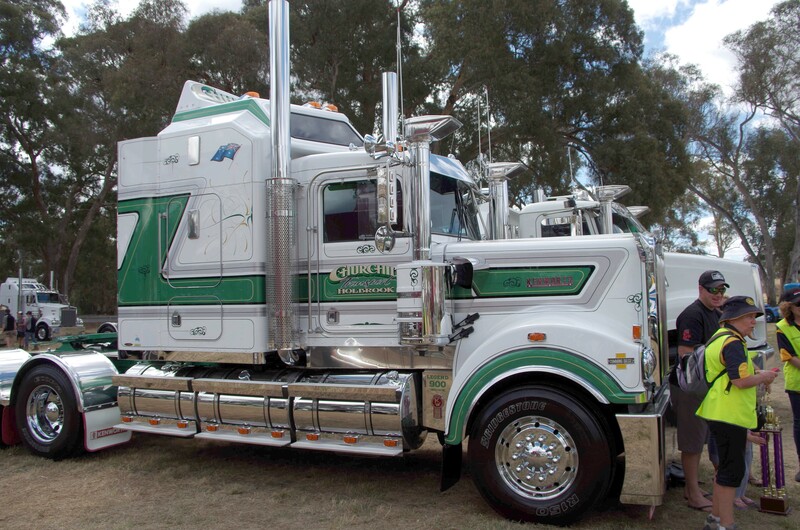 The 2018 Adtrans Castlemaine Rotary Truck Show has come and gone, and what a roaring success it was. We were blessed with wonderful weather, so there was no reason not to enjoy the weekend. A total of 235 rigs attended the show this year and, of those, 168 were judged. The average age of the rigs was 9 years, with the oldest boasting 91 years and no less than 55 rigs at 2 years and under. The total of 84,000 horsepower has powered this fleet to just short of 150 million kilometers to date — that’s 3.851 trips around the world, or 200 trips to the Moon and back. The fleet was dominated by Kenworth (113) and Mack (17), with 15 brands represented overall. Fleet entries — 3 or more rigs — featured 66 rigs from 11 fleets. Our Sunday morning convoy stretched 3.4km. Along with the trucks, there was a free jumping castle and slide for the youngsters, camel rides, Wildlife Gone Walkabout to get up close and personal with some reptiles, remote-control model trucks, a children’s art experience, and lots of truck accessories and associated merchandise. Almost constant music maintained the buzz through the venue, a great selection of food and drink kept everyone fed and the Eljay Freestyle show provided thrills. Check out the Photo Gallery to see how it all happened. If you’d like to keep informed about the 2019 Truck Show, simply click on the “Signup for Newsletter” link and fill in your details. If you've previously signed up for information on the Truck Show, there's no need to sign up again.